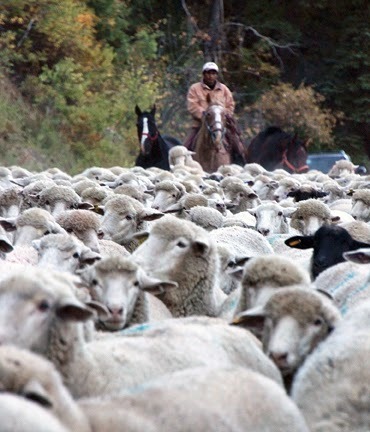 Although it isn't common, occasionally one encounters a herd of sheep on the highway in Colorado. They are either coming from or going to high country where they pasture for several months. On a recent trip over Kebler Pass we came around a curve and there they were! by the hundreds. There's no choice but to stop or run over them so we waited until the herders could clear them away and took advantage of the photo op. The furry creatures were polite and moved right along. Of course the sheep dogs nipping at their heels and barking created a good incentive.